This recently totally renovated apartment building is for sale. The building consists of 8 unfurnished apartments. The building comprises of a two-bedroom apartment and 7x one-bedroom apartments. Each apartment has its own washer/dryer connection. No tenants need to share a communal laundry room! Almost all apartments have a beautiful Atlantic Sea View. Watch our Youtube walkthrough for a realistic preview! Lambeau is a village that stretches along the Atlantic Sea Coastline. Here you will have views overlooking Scarborough UpTown and the Magdalena Grand Hotel. Scarborough is minutes away, yet your neighborhood is quiet. Public elementary and secondary schools are all close-by. Are you interested in purchasing this Apartment Building for Sale in Lambeau? 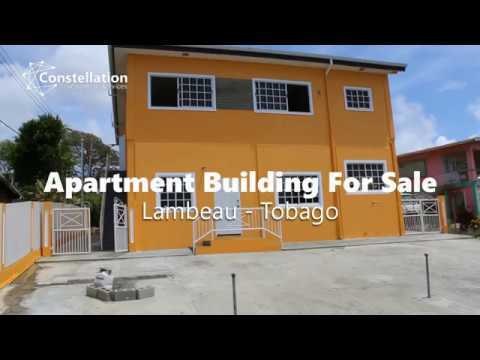 Or are you interested in to sell or to buy Real Estate in Trinidad and Tobago? Contact us during business hours +1863325354 or fill out the contact form below.